Can you spell f-r-i-v-o-l-o-u-s? 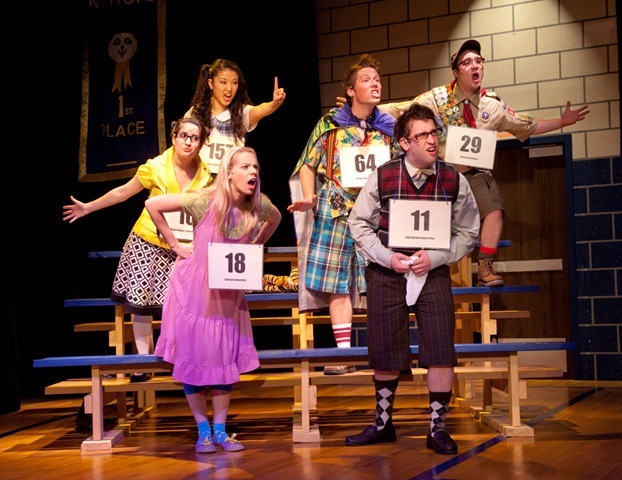 Airy as Wonder Bread, sweet as Gummi Bears, The 25th Annual Putnam County Spelling Bee offers a fun and unchallenging evening of musical comedy that will get you home well before the babysitter’s deadline and won’t stick you with inconvenient earworms or lingering deep questions. 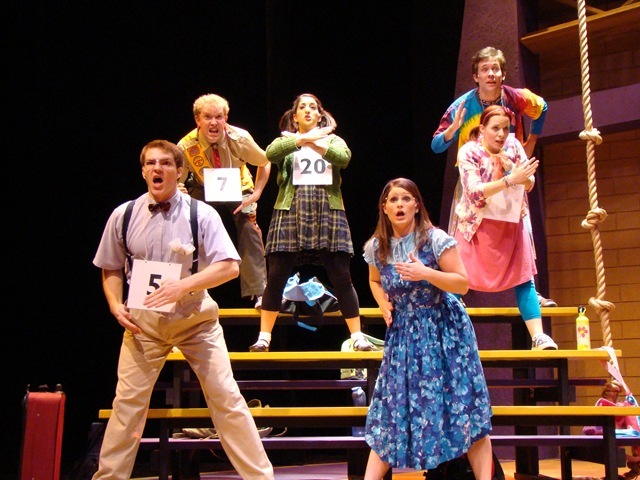 Winner of the 2005 Tony Award for Best Book of a Musical, Spelling Bee began with Rebecca Feldman’s sketch C-R-E-P-U-S-C-U-L-E for her New York comedy group, the Farm. It came to the attention of Falsettos composer and lyricist William Finn, who brought on Rachel Sheinkin to help him create a musical adaptation. Opened in 2004 by Barrington Stage Company in western Massachusetts, the musical ultimately became a hit on Broadway, where it played for 1,136 performances. 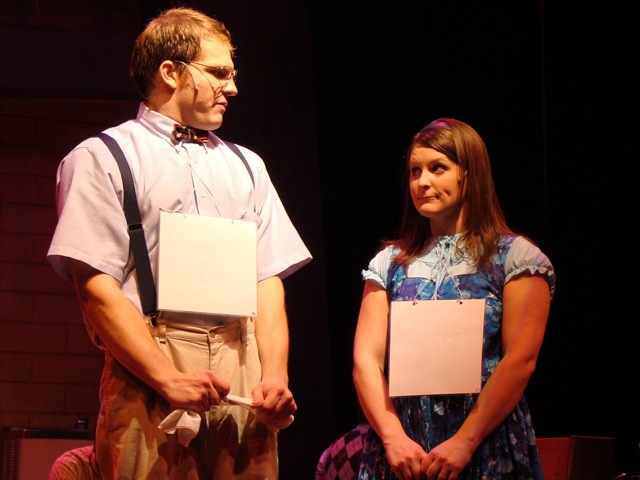 The laughs come from juxtaposition of latter-day life problems, age-old preteen angst and the sentimental nostalgia of the old-fashioned spelling-bee competition. Kevin Bellie and Peter Storms’ vigorous production for Noble Fool Theatricals is as cute as can be, with a bouncy, talented cast and a lively staging. 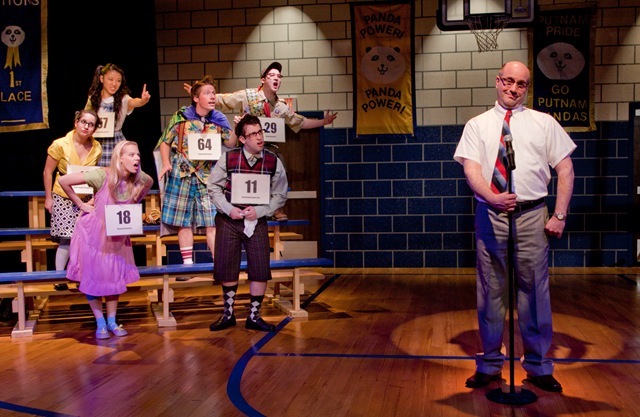 Spelling Bee runs about 90 minutes with no intermission. On opening night, things stretched out a bit longer when one of the audience members participating in the bee — four volunteers are selected for each performance — proved to be an unexpectedly good speller. Having successfully navigated "catterjunes" (part of the show’s improvisational shtick — it isn’t a real word, so they can accept or reject spellings as needed), he also got through "lysergic acid diethylamide" and had to be eliminated with "xerophthalmiology." A very strong cast of adult actors aptly plays the competing kids, bringing out their humorous quirks without turning them into cartoons. Especially notable performances come from Samantha Dubin as gawky Olive Ostrovsky, anguished over her missing mom — gone to an ashram in India — and emotionally distant dad; Jack Sweeney as the wide-eyed Leaf Coneybear, rising above his family’s expectations; Cara Rifkin as Logainne Schwartandgrubenierre, a determined grammar-school prodigy urged on by her two gay dads; and Ian Paul Custer as William Barfee, a nasally challenged nerd who spells out words with his "magic foot." Chie Isobe plays uptight overachiever Marcy Park, and Erik Kaiko is Chip Tolentino, the too-confident previous year’s champion. Wonderfully expressive Michael Weber portrays Vice Principal Douglas Panch, increasingly tortured and hilarious as the event goes on. 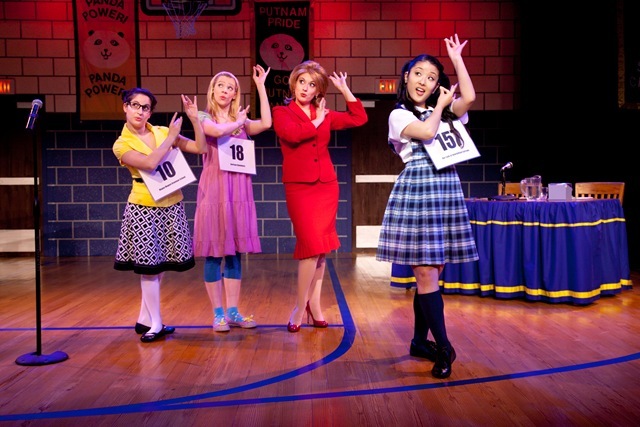 As perky Rona Lisa Peretti, Putnam County’s #1 Realtor and the spelling-bee hostess — reliving her own triumph of the second annual Putnam Co. spelling bee — Liza Jaine solos only briefly, but her powerful backup vocals help hold the show together musically. Randolph Johnson adds a rich note as ex-con Mitch Mahoney, especially in his solo, "Prayer of the Comfort Counselor." Though they’re mostly good-humored, some gags uncomfortably straddle the line between colorful characterizations and offensive caricatures, a blemish exacerbated by Bellie’s casting and Kimberly G. Morris’s costumes. Sheinkin wrote in the flaming gay dads and the overachieving Korean kid, but it was Bellie’s choice to cast the only African American in his show in the parolee’s part and Morris’s to drape him in gold gangsta chains. Amusing lyrics in songs such as "My Friend, the Dictionary" and "Pandemonium" make up for the banal tunes of Finn’s mostly pleasant, but typically repetitive score. Don’t look for big song-and-dance numbers. Like everything else about this show, the songs lack heft, and sometimes seem like fillers. Overall, this musical isn’t about the music. Just enjoy it as a lighthearted romp. 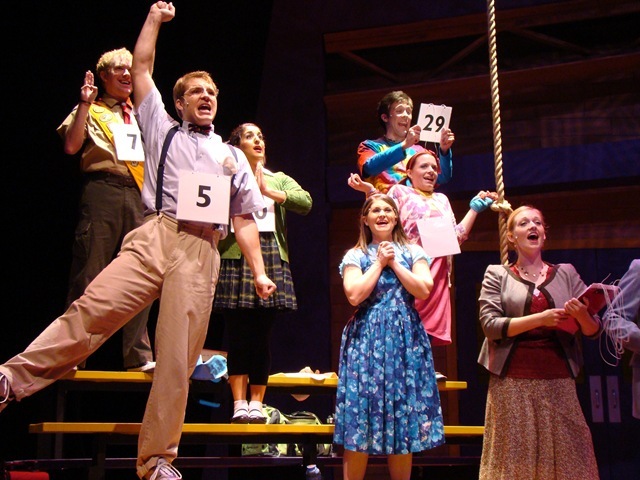 Note: The 25th Annual Putnam County Spelling Bee contains adult language and themes that parents may consider unsuitable for young children. Yet another movie-turned-musical (e.g., The Producers, Shrek, The Wedding Singer, Billy Elliot, Hairspray, Legally Blonde, 9 to 5, etc.) to be added to the list: Little Miss Sunshine. This in-the-works musical will make it’s debut next winter at the La Jolla Playhouse. The 2006 Oscar-nominated, Sundance hit about a lovably dysfunctional family has signed up composer/lyricist William Finn (25th Annual Spelling Bee, Falsettos, New Brain) and book-writer James Lapine (Into the Woods, Sunday in the Park with George, Passion). With such proven talent, this has the making of a hugely-popular hit. True, the movie’s dark humor can be quite outrageous, but Finn thrives on such edginess. 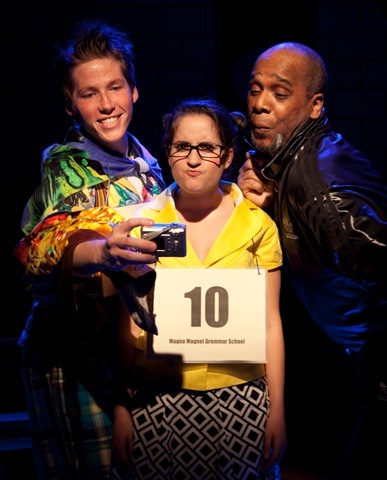 And Lapine and Finn have shown that they can play-well-with-each-other through their award-winning collaboration – The 25th-Annual Putnam County Spelling Bee. Truth be told, with Chicago’s known affinity for new plays, we seem like a much better fit for just such a debut. But being that Lapine has worked with La Jolla on previous premiers, it makes sense that they landed the gig.